If anyone thought this year’s Congressional Cup racing might be predictable: guess again... Today’s opener – Qualifying Session One of the 51st Congressional Cup, and the start of the 2015/16 World Match Racing Tour – was anybody’s game. 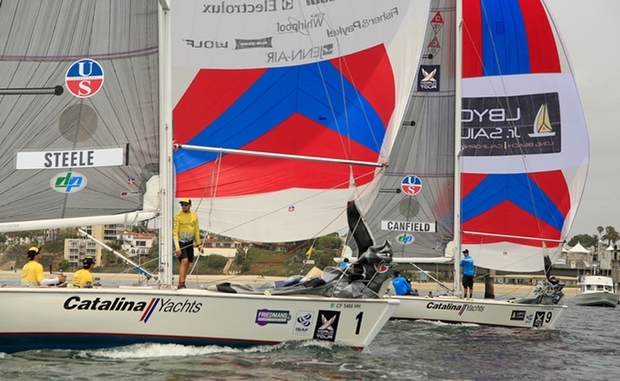 Reigning ISAF Match Racing World Champion Ian Williams (GBR) tumbled to Chris Steele (NZL) – who just last Sunday qualified for the Congressional Cup, by winning the Ficker Cup. Young Dane Joachim Aschenbrenner ran top-five ranked Eric Monnin (SUI) up and over the line early, to take the start (and race); while defending Congressional Cup champion skipper Taylor Canfield (ISV) bowed to New Zealand’s Reuben Corbett (NZL). As commentator Steve Steiner announced: "It’s wild to see Taylor in the back: that’s not something you’re used to!" But it was leaderboard limbo, with nearly everyone getting a piece of the action, on this first of five days of racing in the breezy outer harbour of Long Beach, California. The results were particularly exciting as the field includes several Congressional Cup virgins – a position often perceived to be a disadvantage: racing a new venue, on unfamiliar boats. "On the other hand I know it’s twelve really good teams here, so it is going to be tough," he added. Hansen and Aschenbrenner are both competing in their first Congressional Cup, while Steele races for the first time as a skipper. The Congressional Cup is hosted by Long Beach Yacht Club and is the season opener for the 2015/16 World Match Racing Tour. A total of 12 teams, from nine nations, are vying for the trophy and the iconic Crimson Blazer. At last night’s ‘Meet the Skippers’ gala dinner, the crowd got a chance to see the true personalities behind the competitors’ ‘game face mug shots’ – and feel some love. Eric Monnin recalled fond memories of past Congressional Cups; strumming a pink guitar, drinking beer and eating pizza on the dock. Aschenbrenner – fierce on the race course – was nervous and shy about having to make a speech. Swinton announced to the LBYC membership, "Congressional Cup is the highlight of the year for us." And Phil Robertson summed it up, saying, "We love this event because of you guys. The sailing is fun here, but it’s fun everywhere in the world. But not every event is as fun as this." Conditions were moderate, with breeze in the 6-10 knot range, and partly cloudy skies. Eight of Fourteen Flights of Qualifying Round Robin 1 were completed and Taylor Canfield’s US One Sailing hit the top of the leaderboard on 6-1 with Ian Williams’ GAC Pindar, Rueben Corbett’s Corbett Racing and Phil Robertson’s WAKA Racing chasing hard on 5-2 each. Races begin around 1100 PDT each day.